Say the name 3 times and you’re in trouble! Bloody Mary, Bloody Mary….’Beetlejuice‘? Talking about none other than the original black and white stripe suit wearing master of disaster before Robin Thicke took a crack at the outfit, and the disaster that is Miley Cyrus. Before he came along, Michael Keaton did it better than anyone could imagine. Tim Burton knew he was making an excellent casting decision bringing ‘Mr. Mom’ into the mix. 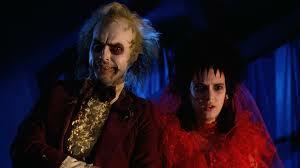 Michael Keaton, himself, said in an interview that he and Tim Burton had been talking about making ‘Beetlejuice 2’! During a junket for his latest film, a remake of ‘Robocop’, Keaton told MTV that the sequel is getting closer and closer to becoming a reality. We have written about this several times before, which you can read HERE. Keaton has been wanting to make a sequel for the past 20 years and will basically talk about it every chance he gets, or to anyone who will listen to him. 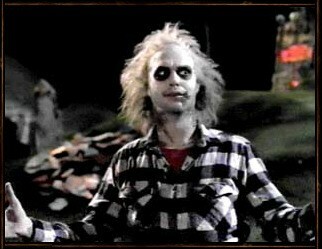 He was definitely robbed of an Oscar for his role as Beetlejuice, in my opinion. But now it looks like this project is gaining even more steam, which is AMAZING! Besides Keaton’s positive news on the subject, in November, Winona Ryder, who played Lydia Deetz and Beetlejuice’s love interest, hinted that she was working on a sequel saying, “I’m kind of sworn to secrecy, But it sounds like it might be happening.” Ryder also put our minds at ease by saying it is NOT a remake, “It’s 27 years later, and I have to say, I love Lydia so much. She was such a huge part of me. I would really be interested in what she is doing 27 years later.” Some of us love and relate to ‘Beetlejuice’ in so many ways. Personally, I found myself making a Sand-Shark shadow puppet. Some of us have been ready for this sequel for 27 years. Currently, the man, Tim Burton-himself, has been working on ‘Big Eyes’, a film about painter Margaret Keene that stars Amy Adams, Krysten Ritter and Christoph Waltz. That film is in postproduction and he has not said officially what he is working on next. This entry was posted on Friday, February 14th, 2014 at 5:27 pm	and is filed under Film, News. You can follow any responses to this entry through the RSS 2.0 feed. You can skip to the end and leave a response. Pinging is currently not allowed. « Ron Howard Might Direct The Live-Action Adaptation of ‘The Jungle Book’! !